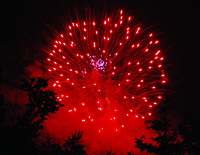 Every year, Moorpark holds their Independence Day festivities on July 3rd. Part of the celebration is a flyover of 4 WWII T-6 Texans. 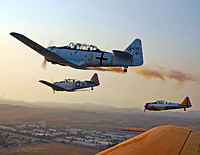 The Condor Squadron, based at Van Nuys Airport performed the flyovers this year. The flight was led by Chris Rushing, who just returned from military duty in Afghanistan. The other pilots were Will Kalbermatter, Stu McAfee and Ken Gottschall. I wish to thank all four of these guys for bringing me along for this flight and allowing me the opportunity to photograph this. 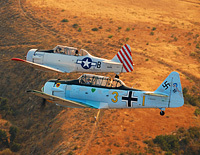 I also want to send a thank you out to the CAF SoCal Wing for the SNJ that was my ride for the shoot. Last, but not least, I wish to thank the City of Moorpark for contracting these guys for this and for the fireworks. One of the other passengers was Patricia Kennedy. She is an actress, model and philanthropist. Her project, Step Up 4 Vets is a worthy cause and one that is close to my own heart, being a veteran myself. The mission of Step Up 4 Vets, a non-profit organization, is to partner in the transition of our returning veterans as they readjust, redirect and rebuild their civilian lives. She also had the honor of being in the airplane that rose from the formation for the "missing man", honoring all those lost in conflict.